Over the course of a week the entire planet is thrown into chaos as Black Adam travels from country to country reigning chaos down on the populace with super-heroes from all walks of life trying to stop his march of destruction. Captain Marvel had tried and failed to stop him earlier in the week but as the Justice Society and dozens of other heroes are finally allowed in China on the seventh day of the war Captain Marvel comes up with a plan to stop the out of control Adam. Unable to convince the Egyptian deities who give Adam his power to rescind Adam's power Marvel calls down his own lightning and with his abilities as the new guardian of magic changes the word that changes Teeth-Adam into Black Adam. Adam survives the fall and shambles off as a mortal searching desperately for the word that will restore his abilities. Story - 4: This was almost the first real disappointment of this series for me. I will fully admit that on the first read through I was left with a sense that everything wrapped up way too quickly. The pacing of this issue was (no pun intended) lightning fast and the events unfolded as if the DVD player was left on double time. Despite this I kept reminding myself throughout the issue that this was the overview of the week as well as the dramatic conclusion leaving all of the little details to the four issue WORLD WAR III mini-series that also came out this week. On one hand it is kind of unfair and disingenuous to the spirit of a self-contained weekly series that is taking part in a separate time frame than the rest of the DC Universe to have one of the bigger storylines wrapped up outside of the main book. However I am pretty hip enough as a reader and fan to realize that not only could you sell a few more books by having the mini-series come out the same week as issue fifty but also, and more importantly, the epic quality of the story called for the extra room. So keeping all of that in mind I read the issue again and frankly it served as not only the spine of this part of the story but also gave us the exciting and action packed conclusion. Was it still an almost too quick of a read? Yes, but at the same time it brought Black Adam's story to an end in a rather fitting way. I mean John Henry, Renee Montoya and Ralph Dibny didn't get four extra books did they? One of the more interesting transitions for me as a reader is how my opinion of Black Adam changed over the course of the issue. I have been very vocal in my support of Adam and his righteous vengeance and I still stand by the fact that his siege on Oolong Island was completely and totally justified. What the writers of this series illustrated in this issue (and what the two writers of WORLD WAR III illustrated) is that there is a point where you can go way too far. Black Adam simply lost control and his actions in this issue certainly proved that. Because of this my support of the character waned. I wanted him to be brought down. He needed to be brought down. Nothing justified the carnage he unleashed on the world and for the first time in the entirety of this series I wasn't pulling for Black Adam anymore. I still liked the character and I continue to find him interesting, but I couldn't back his actions anymore and I really think that is why my opinion of this issue turned around. The aspect of this issue that impressed me the most, though, was the resolution. If you read enough stories concerning magic, especially in comic books, then the line "the power of names" pops up again and again and again. So it is interesting to finally (and I write finally because I really can't remember another time this has occured, but that doesn't mean that I'm right that it has never happened) see a writer, or writers, use that plot device with characters that literally get their powers from a name. It's a forehead slapping moment where the obviousness becomes readily apparent and you wonder why no one has done it before. To put it into technical terms, Billy hacked into Adam's website and reset the admin password. I liked it not only because it was so damn clever but also because it takes Black Adam out of the game only to set up the time when he finally discovers the new name which will give him his power back. It was both a satisfying and logical conclusion but also a tease to the time when Adam returns. Suddenly I have my cake and get to eat it too. Boo yah. So with all of that added up to the charge of the Justice Society brigade I had to finally admit that the book deserved a four. It may have been a little rushed but it was a satisfactory conclusion to Black Adam's part of the series. Art - 4: The art nearly fell apart for me on that first double page splash of Black Adam and Captain Marvel fighting. It looked... awkward. The art of this series has, on the whole, had a smooth appearence to it and while Justiniano isn't by any means a bad artist I just thought his style looked out of place. Like the story the art grew on me over the course of the issue and I have to say that the final battle looked great. So despite a rocky start I was fine and dandy, dandy and fine by the end of the issue. 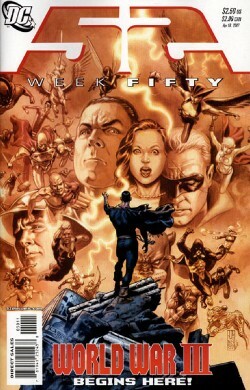 Cover Art - 5: So that's what it looks like when you call out nearly every super-hero on the planet. Seriously, this was a great cover and at fifty issues in I have to say it is my favorite. It sums up the feeling of the book in a single image. Awesome.